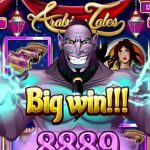 The Genie is the scatter symbol and landing 3, 4, or 5 will win you 12, 25 and 50 free spins. 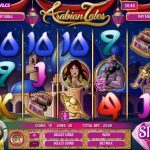 Obviously the free spins can only start after you get to the cave and say “Open Sesame”, what else? Any win here will get you 3x on what you make. The other scatter is the Tiger and landing 5 of those will win you 50x on your bet! 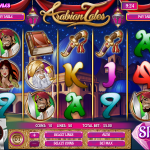 Arabian Tales is a great success for Rival. They really hit all the correct buttons when creating this game. The graphics and sound effects are an evidence to why this game is so popular. All the bonus features packed in this game will make you stay and want to reveal everything this game has to offer. Some people like trains. If you’re one of them then try playing All Aboard a 5 reel slot by Rival.